WARNING: This product can expose you to chemicals, which is known to the State of California to cause reproductive. For more information, go to www.P65Warnings.ca.gov. The TempMinder® features 3 remote sensors and 1 indoor display station to monitor both temperature and humidity of 4 separate zones. Features simultaneous readings of all 4 zones with programmable high and low temperature and humidity alarms. Perfect for monitoring your RV fridge or freezer, compartments/basement, heat safety and exterior monitoring! 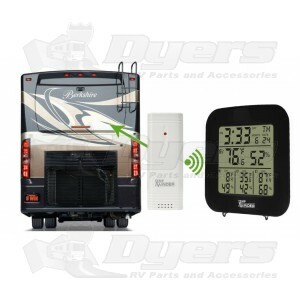 Monitors 4 zones with simultaneous temperature and humidity readings. Displays MAX/MIN temperature and humidity. Perfect for RV fridge/freezer, compartment and exterior monitoring. Includes 3 remote sensors and base station.